Of all the challenges aircraft maintainers face, this might have been one of the strangest. After an F-22 Raptor landed at Joint Base Langley-Eustis, Va., June 11, maintainers discovered that a swarm of honey bees had descended on the fifth-generation fighter, A Defense Department press release noted that "this had never happened on the flightline before." The swarm of bees — about 20,000 of them, according to an expert called in by the base — were hanging from the aircraft's exhaust nozzle. 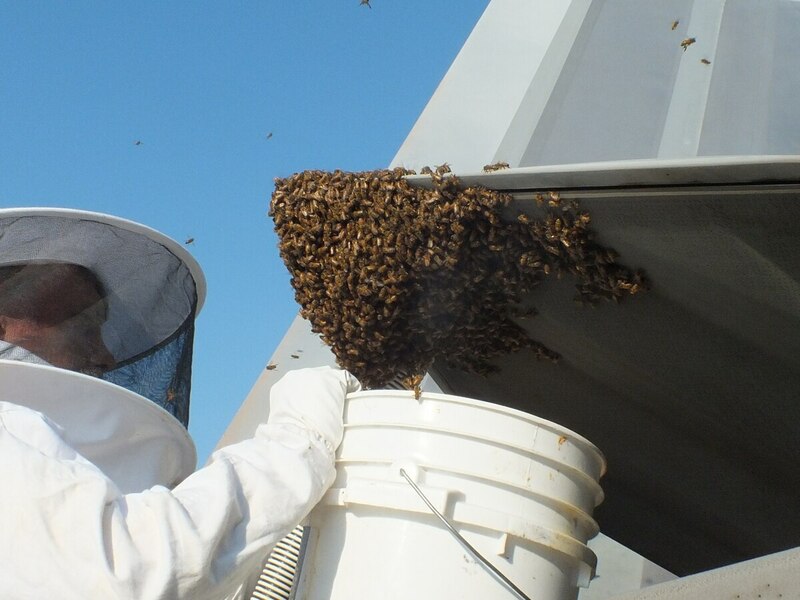 "The honey bees most likely came from a much larger bee hive somewhere else on base," said Chief Master Sergeant Gregg Allen, the Air National Guard's 192nd Maintenance Group quality assurance chief, who, coincidentally, happens to be a beekeeper. "Bee hives are constantly growing and they eventually become overcrowded," Allen said. "Around springtime, the bees will make a new queen, scout for a new location and take half of the hive with them to that location." The first reaction of maintenance personnel was to find some way to get rid of the bees. Tech. Sgt. Jeffrey Baskin, a crew chief with the 192nd Maintenance Squadron, suggested finding some way to move the swarm. "I was shocked, like everyone else, because it looked like a cloud of thousands of bees, but I knew they wouldn't sting anyone and were just looking for a new place to live," Baskin said. "My neighbor maintains two colonies of honey bees, and I knew they are at risk for extinction, I figured we might want to get a honey bee expert out to collect them." The aircraft maintenance officer and on-base entomologist decided to call in a local beekeeper. The expert, Andy Westrich, a Navy retiree, reportedly told maintainers it was one of the largest swarms he had ever seen. Westrich believes the colony's queen bee landed on the F-22 to rest, and the swarm followed, according to the Pentagon press release. Queen bees generally do not eat for up to 10 days before leaving to found a new colony, and therefore are often malnourished for the journey, the release said. Capt. Katie Chiarantona, an aircraft maintenance officer, said Westrich told her that one of two things would have happened: "the queen would have rested and gained energy and the swarm would've left in the morning, or they would have decided that the jet engine would be a great place to build a hive." Westrich was able to safely relocate the bee colony to a local beer producer that will make use of the honey produced. "Every bee is important to our food source. Lots of things would die without bees," Baskin said. "Most of our crops depend on bees, and our bees need to pollinate. This is why I knew we needed to save them instead of [exterminate] them." As for the 192nd, maybe a "Buzzin' Bees" nickname is in order.